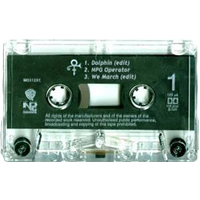 Label(s): NPG Records / Warner Bros.
Dolphin was available as a promotional cassette single from Prince's 17th album The Gold Experience, the first album to be credited to , and was available around the time of the album's release. The single contains edits of Dolphin and We March (which was also taken from the album), as well as an NPG Operator segue between the tracks. Unusually, the release did not include any artwork. The single did not enter the charts, and no commercial release was available. This single wasn't released in CD or Digital format. None, although had performed Dolphin on The Late Show with David Letterman the previous year (see here for details), and the Dolphin video had been used to launch VH-1 Europe in late 1994 as the first video to be shown on the channel.